The final section of the AWPR will open tomorrow, marking the “beginning of an important new chapter for Aberdeen”. The completion of the congestion-busting 36-mile bypass, which could come in at a cost of £1 billion, has taken months longer than expected with work on the Don Crossing being struck by delays. Transport Secretary Michael Matheson yesterday confirmed the final stretch, between Craibstone and Parkhill, will finally open tomorrow morning. The bypass was first proposed more than 65 years ago and more than 85% of the road, stretching from Stonehaven to Aberdeen Airport, opened in December. However, final safety and structural work on the last 4.5 miles took longer than anticipated and contractor Aberdeen Roads Limited (ARL) was unable to finish the project on time. Last week, the firm was finally able to offer the “technical reassurances” needed in regard to the Don Crossing. The last section will link the southern Craibstone to Stonehaven and the Charleston section with the Parkhill to Blackdog stretch in the north. The Craibstone, Parkhill and Kingswells North, northbound, junctions will be fully opened once signs have been uncovered, road markings completed and temporary traffic management measures removed. Aberdeen City Council and Aberdeenshire Council both ploughed £75 million into the project and co-leader of the city council, Jenny Laing, yesterday said it would contribute to the economic “transformation” of the area. Fellow co-Leader, Douglas Lumsden, said he hoped the bypass will relieve traffic problems in the city centre and make it a more attractive place to visit. He said: “The premise of the city centre as a destination rather than a thoroughfare will become far more appealing. Lewis Macdonald, Scottish Labour MSP for the North-East, said: “Tuesday morning will be exactly sixteen years and three weeks after former First Minister Jack McConnell announced the decision to build the Aberdeen Western Peripheral Route, so it’s fair to say this day has been a long time coming. “The last few months have perhaps been the most frustrating part of a very frustrating process, whereby the dates of completion of the various sections of the road and of the route as a whole have been delayed and delayed again. 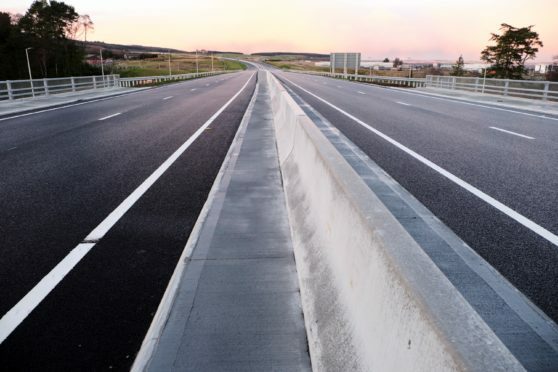 “Taxpayers in the North East have paid hundreds of millions of pounds to get this high-quality modern road put in place, so they will be delighted they will finally be able to travel its entire length this week. “It will make a huge difference to drivers’ journey times, and to the economy of the North East as a whole. “Sadly, the project has been neither on schedule nor on budget, at least not according to the contractors who have built it. “They claim to have spent over a billion pounds on the project, as against a fixed price of £745 million, so there is a big gap between what the road should have cost and what it’s actually taken to get it built. “On top of the embarrassing contractual disputes between Ministers and contractors, many questions remain to be answered, not least why it has taken the current Scottish Government nearly twelve years to deliver a scheme already planned and designed when they took office in May 2007.